Hi, I'm Kaja, I'm German and I like bread. At least that's the cliché and I am definitely meeting it. Living a year in Paris didn't change this situation, it made it even worse. A dinner without a piece of baguette or nice piece of bread?! Impossible! Dipped in the remaining sauce of the main course (which is a do in some countries and a don´t in others, but if I like a dish I want to finish it to the bitter end!) or to accompany some cheese at the end of a meal, doesn't matter, it's an essential part. The boulangerie just next to my appartment in the 15th arrondissement in Paris, was selling one of the best baguettes. This made it hard to resist from buying one every or every other day and I have to say, I still wonder why so little bakeries manage to bake baguette the way the French do; crispy on the outside and inside that fluffy, elastic and oh so tasteful dough. That's why I'm on the constant quest of finding it; the perfect one, the one making me happy until the rest of my life - or until I´ve eaten it, so probably just a few minutes, best case hours. I've found a few ones so far, but unfortunately had to leave them in Paris. What I've learned in Brussels while visiting some of the bakeries, is that Belgian people have quite different requirements when it comes to bread. What they categorize as "good bread and baguette" is not necessarily what French people would approve (or me). Apparently sourdough is not super welcomed and neither is a too crispy and hard crust with a gooey and elastic inside. Many like their bread pre-cut which is not possible with all breads because then the slices will stick together or get dry quite fast. Therefore, while I'm living in Brussels, these following 5 bakeries are my trusted ones so far. I like my bread just as those ones bake it - crispy outside and perfect, not too soft but rather gooey on the inside. I am also happy about any other recommendations! Everyone should have a French baguette or a German sourdough bread in their lives! The simple yet nice logo on the big window facing the street, next to the entrance door says it all: Gâteau. Cake, that's what you'll get. But not only. They sell perfect baguette, croissants and all the other things a good bakery should have. The French baker Baptiste is happy to tell you his stories about bread and to introduce you into the secrets about good baking. When you enter the boulangerie-pâtisserie you'll be greeted by a large black cupboard with a selection of different breads (with grains, nuts, dried fruit and made from sourdough and spelt, rye, wheat or other flours) and of course - baguette, either the ´tradition´ or the longer version of it, the Ficelle. 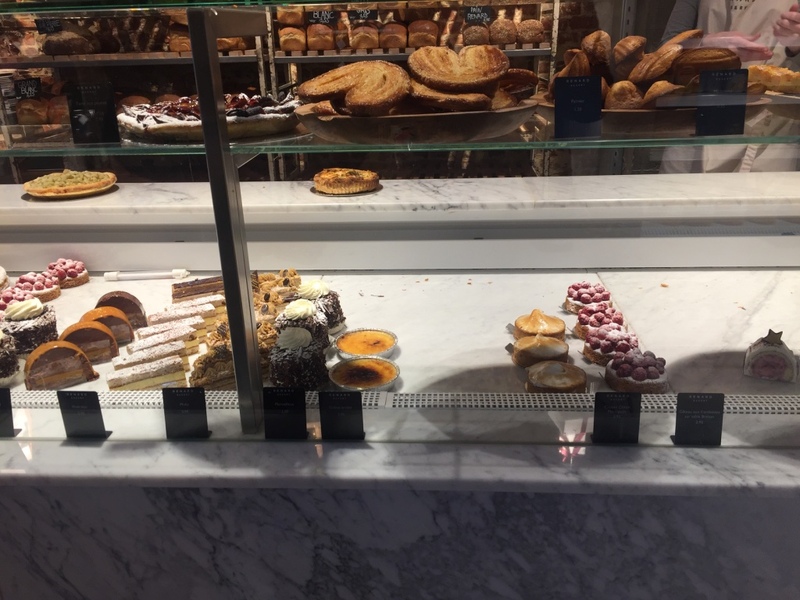 The black-copper lamps put the perfect spot on the pastries and yes, this is another place where making a choice is not easy. But I had to make one. The pain au chocolat was exceptional; all buttery, very crispy and the chocolate inside was delicious. I think I have found a new favourite spot for the little chocolate pastry in Brussels. The baguette reminded me of France; all gooey and elastic inside and super crispy from the outside. The Scandinavian bread I tried, made from rye, spelt and wheat flour with apricots and cranberries reminded me a lot of the breads I use to buy when I am in Germany and it was equally delicious. Last but not least, the cherry on top, the éclair with a vanilla filling and chocolate glazing. To be honest, there is no words to describe that one, go and try yourself! Be aware that on weekends lines become long and bread disappears quickly. So either be early, or tell the nice people at Gâteau what you want them to "save" for you. Located right next to Place Flagey, you´ll spot this little bakery easily on a Saturday morning - the line of people waiting to grab one of the delicious baguettes, brioches or savoury treats is unmissable. The French baking chef Laurent Richard is in Brussels already since 1990, bringing the best of French baking culture to the European capital. The bakery on Flagey, however, opened quite recently. I tried a very nice olive focaccia, their baguette and another savoury pastry with goat cheese and ham and to be very honest, I would´ve liked to buy much more. Their chouquettes looked as if they were very keen on being dipped in my morning coffee, while their shiny chocolate bun (nope, I don´t mean Pain au Chocolat) reminded me a lot of the ones I used to eat in Paris; cut in half with soft, salted butter on top. They also have a choice of breads made from different flours such as rye or spelt, different sorts of baguette, éclairs, fancy little cakes and much more you should discover. They have two places directly on the opposite of each other, one focussed on sweet the other one on salty things. If you're interested you can peak into their kitchen, where all the magic is happening. It´s hard to pass this place without recognising it, let alone entering. Their tarts are presented right at the entry, filled with fruit, chocolate and other delicious ingredients. They sell all kinds of breads, brioche, tarts, croissants, sandwiches and even jams. I haven't tried their cakes yet, but the artisanal baguette, their Madeleines, Croissants and one of these waffle sandwiches filled with heavy vanilla cream. I liked all these things and so did my two friends, who are French baguette lovers and don't approve anything. Portugal in Brussels. I haven´t been to Portugal yet, but it´s high on my to-go list. Until then, I´m catapulting myself there gastronomically. Pâtisserie Garcia, or Pastelaria Garcia, is a spot in Brussels I really like. It's unpretentious, people are very nice, prices are very low and the coffee and food is great. It's a short walk away from my apartment and until now, all visitors I brought here were happy and so was I. We sat down at one of the stone tables with a view facing the inside of Pâtisserie Garcia. It's kept in dark blue and white colours with a few traditional and nice elements such as a small fountain attached to the wall. The waiters speak French or Portuguese, depending on what you prefer and are fast and friendly. We ordered a Portuguese coffee with milk (or as they call it: Galao), two Pastel de Nata, a ham and cheese croissant and a thick piece of toast with salted butter on it. All simple but delicious and enjoyed in a great atmosphere. Also, both times I've been here there was plenty of Portuguese people, which means that they seem to approve it.